The Book Thief suffers from two distinct problems – in the first two thirds, it is a bit disconnected with its details, but has its share of professional and efficient moments. In the last act, everything comes together and has much more clarity, but it becomes very emotional, and sometimes overdoes it. Brian Percival’s film is an undoubtedly mixed product, ultimately a grab bag of achievements and could-have-beens. The acting is usually good, the visuals atmospheric, and John Williams delivers with his iconic orchestra-based music, but the actual script is a bit of a mess, and hurts the movie’s impact as a whole, no matter how good the other elements may be. Based off Markus Zuzak’s novel, The Book Thief tells the story of Liesel (Sophie Nélisse) an 11 year old girl living in Nazi Germany. Her mother (Heike Makatsch) is at risk due to her communist beliefs, so she is she is sent off to live with the Hubermanns – Hans (Geoffrey Rush) is a kind, humble man, but his wife Rosa (Emily Watson) is strict and cynical. Her best friend is Rudy (Nico Liersch), the boy who lives next door. They meet on her first day at the local school. We quickly learn Liesel is illiterate – when asked by her teacher to write her name on the blackboard, she is only able to write the letter “X” three times. 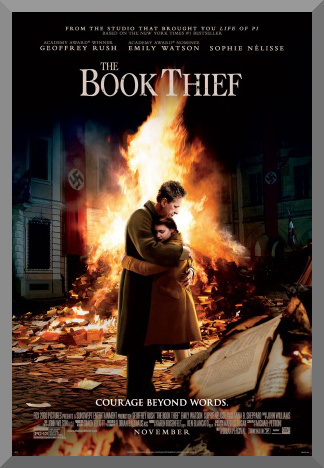 She learns to read, with help from Hans, and advances her knowledge by stealing books, an interesting juxtaposition after she attends a speech given by Nazi officials which climaxes in a large pile of books being burned in the town square. Throughout the rest of The Book Thief’s 131 minute runtime, Liesel’s realization of her surroundings and how it affects those around her becomes the focus of the film, like a Jewish refugee named Max (Ben Schnetzer) that moves in with the Hubermanns. However, the importance of those books are never forgotten. A movie is nothing without its screenplay, and as I have mentioned, Michael Petroni’s adaptation could have used some polishing. There is a level that exists somewhere between the often unengaging first two acts the sometimes overly-melodramatic third that would have crafted a truly great movie; a level of humanity, character, and appropriate levels of emotion. Certainly there are times when The Book Thief displays those, but these aren’t representative of the rest of the film. Consistency issues are also apparent in another problem. As a film set in Germany, the characters often speak in German accents. However, there are inexplicable periods of time where things suddenly switch to German with English subtitles. It just happens, and thinking back to the beginning to the film, once it happens in the middle of a scene. It’s distracting. This is more of a directors’ issue than a screenwriters’ one, but it routes back to the movie’s main flaw. You can’t blame the actors for most of this, as they do their best with what they’re given, and it generally pays off here. Nélisse provides a sympathetic and interesting Liesel. She plays well off Rush’s Hans, who imbues a good warm side to the dark setting, playing the accordion, smiling, and not being afraid to help others, even if it puts him at risk. Emily Watson adds to the cast as Rosa, who hints at a more complex character than is initially let on. The film, much like the book, takes the step of being narrated by death personified. The voiceover is provided by Roger Allam, who provides a dry but effective life to the monologue that travels throughout. Aside from the acting, Florian Ballhaus’ cinematography highlights the small town where the film is set in solid, strong shots, often with threatening Nazi flags fluttering in the background of exteriors, and John Williams rounds everything out with his score. The Book Thief has a great movie hidden within its mediocre one, and whenever we do see what it was going for fully realized on screen, it’s frustrating to see how it was almost there. There is much to commend, but also much to regret. It very much feels like a film that was still being worked out. If only a little more time had been spent going over and smoothing out the rough spots, we would have had an excellent and memorable motion picture on our hands here. This is a movie that you really wanted to succeed, but a series of missteps leave us with nothing more than a disjointed script holding up otherwise good elements.